Want to know how many visits your blog gets, and what pages are most popular. AFS Analytics provides free web statistics on your blog's traffic. AFS Analytics works perfectly on blogger sites and tracks every visitor. With the asynchronous technology used by the tracking code, the load time of your website will be reduced to a minimum and you will get most accurate Blog traffic Statistics. 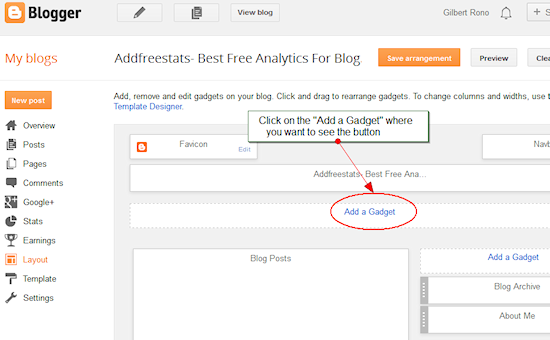 Below are step by step guides on how you can easily integrate AFS web analytics tool into your blogger blog within two minutes. 1)	First you need to create a free account on AFS Analytics. You will get a unique tracking code for your website. 2)	Before you start the installation procedure, you need to make sure that you are logged into your blogger account to access your blogs. 3)	Select "Layout" from the dropdown icon as shown in the screenshot below. 4)	After selecting "Layout" from as shown above, a new page should open where you need to select a place to add the gadget. 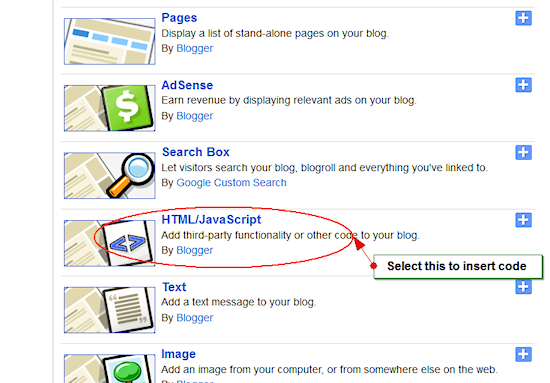 You should select where you would like to place the tracker button on to your site. 5)	After selection on the place to add your new AFS Analytics gadget, a new pop up should now appear prompting you to choose the type of gadget to be added. 7)	After clicking on the gadget, the window opens up an editable region where you are required to paste the HTML code provided by AFS Analytics. 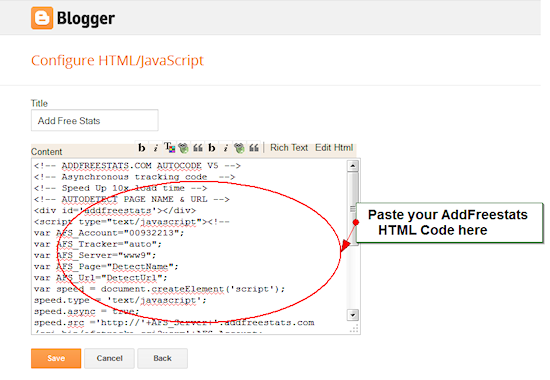 Paste the AFS Analytics tracking code and push the button "save". The tracking is now live and the web statistics can be easily accessed from the snippet that has been placed on your site. Another way to access statistics is by logging into the AFS Analytics website. AFS Analytics is a great alternative to Google Analytics.